Once you've made a decision about all of the basics of your pool, selecting the add-on options can be the most exciting part! 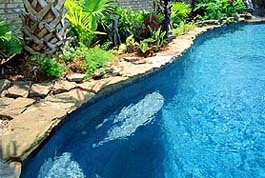 Below are some ideas of the items you can add to enhance the look, feel and enjoyment of your pool. 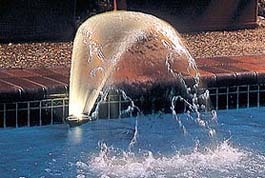 Lighting can add a whole new dimension to your poolscape. 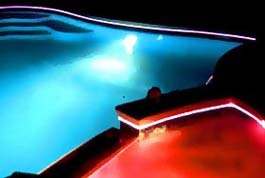 Outline your pool's shape with fiber optics and program the lights to change colors or remain a constant color. The options are almost endless. 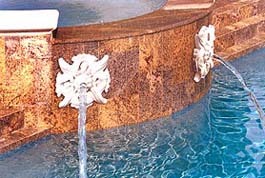 A fountain is a perfect addition to a poolscape. From floating fountains to spillovers and other varieties, just choose the look you like and enjoy! The type of decking you choose for your pool area helps complete the look of your outdoor living area, and today there are more choices than ever before. 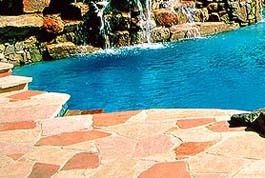 Choose from stone, concrete, and many other options to make your poolscape uniquely yours. 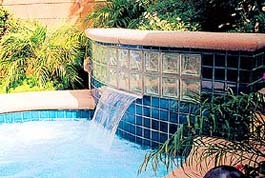 Adding a pool bar creates a relaxing way to enjoy refreshments and never leave the water. Many pool owners are discovering the rewards of this "resort-style" accessory. 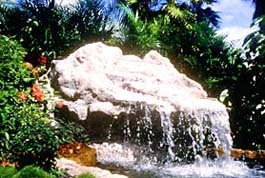 Rock waterfalls add a natural look while adding the soothing sound of falling water to your poolscape. 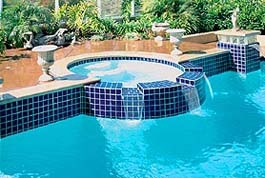 Create the best of both worlds by adding a spa to your poolside. Then create a water spillover that produces a natural waterfall! Seating benches offer you and your friends and family a great option for relaxing in the pool. Explore the many choices for a wonderful addition that everyone is sure to enjoy. The sky's the limit when it comes to adding decorative accents to your poolscape. Have fun making your outdoor living area reflect your tastes and your lifestyle.